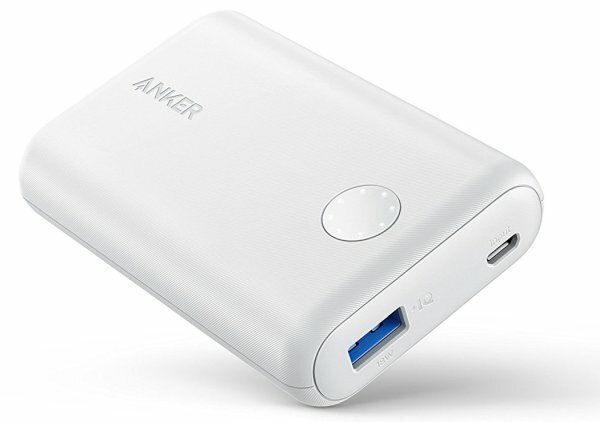 Anker PowerCore II 10000 offers a combination of features that strike a good balance between battery capacity, price, weight and fast charging features that makes it a portable charger suitable for a wide variety of requirements and smartphone types including all the iPhones and the latest Android smartphones. We are going to explain this powerbank’s features in detail and test its performance in detail in this review. Anker PowerCore II 10000 is Anker’s latest single-port powerbank in the 10000 mAH battery capacity (four+ full charges for iPhones 6, 5s, three+ full charges for iPhone 7, 8 and two+ full charges for iPhone X, 8 Plus, & Plus, and latest Android smartphones such as S9, S8, S7, LG V30 etc.. This portable charger was released in mid-2017 and is a comprehensive update of the previous PowerCore 10000 model, which is currently also available in the market at a lower price. PowerCore II 1000 features a completely updated design with a textured grippy outer surface. PowerCore II 10000 is highly scratch and fingerprint resistant due to the new design and this is a welcome design upgrade over old PowerCore 10000. PowerCore II 10000 also has the new clickable button with a six-point battery status display. This button is much more ergonomic to use and view the status of the powerbank than the older side-button and 4-point indicator on the side. PowerCore II 10000 is a very lightweight portable charger, weigh just 6.9 oz(195 grams) with dimensions of 3.8 x 2.4 x 0.9 inches. However, the older PowerCore 10000 is lighter at 6.3 oz (180 gms). Still, PowerCore II 10000 is one of the lightest 10000 mAH powerbanks in the market. The .9 inches thickness of PowerCore II 10000 does not make it very pocketable. If you want a slim powerbank, then we recommend the excellent (and lower priced) PowerCore II Slim 10000 with its .6 inch thickness and exact same fast charging features as PowerCore II 10000 . The highlight feature of PowerCore II 10000 is 18-watt fast charging output and 18-watt fast charging input. 18-watt fast charging output enables PowerCore II 10000 to charge all Samsung smartphones at their fastest charging speed. 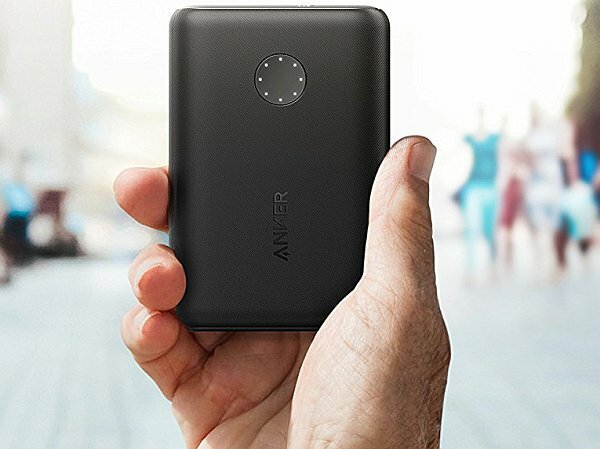 Anker currently offers five powerbank models in 10000 mah range. All the 5 portable chargers have one USB charging port. Here is a brief overview of each model and how they differ from each other. PowerCore 10000 is the lightest and most compact model with just 6.3 oz weight (180 gm) and 12 watt max output. It is also Anker’s lowest priced 10000 mAh powerbank as well. This portable charger is best suited if you simply want the lightest and most compact powerbank at a minimum price. This portable charger can charge iPhones and Android phones at a maximum charging speed of 2.4 amp or 12 watt (35- 50% charge for most phones in about 45 minutes) and gets fully charged in 5.5 hours using a 2 amp wall charger. PowerCore II 10000 is a 18-watt fast charge powerbank and weighs 6.9 oz (195 gm). This powerbank supports the fastest charging mode (18-watt max or Quickcharge 2.0 equivalent) for the latest Samsung smartphones including S9, S9+, S8, S8+, Note 8, S7, etc. Fast charge allows you to charge your phone to 50% in 30 minutes. It will also charge iPhones at 12 watt max charging speed ( about 50% in 45 minutes). The powerbank also has fast input charging meaning you can fully charge the powerbank using a Quickcharge wall charger in just 4 hours. 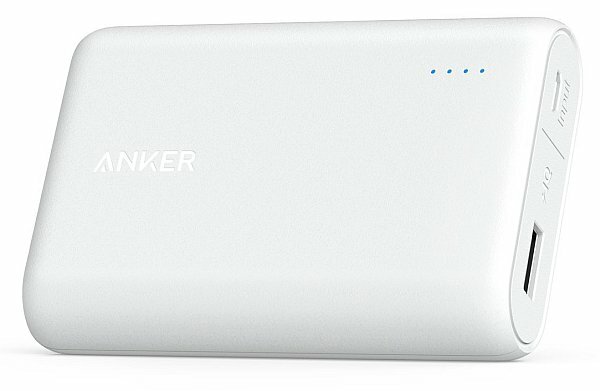 Anker PowerCore II Slim 10000 is a 18-watt slim fast charge powerbank and weighs 7.4 oz (210 gm) . This portable charger also supports the fastest charging mode (18-watt max or Quickcharge 2.0 compatible) for all the the latest Samsung smartphones including S9, S9+, Note 5, S8, S8+, Note 8, S7, etc. This means that this powerbank allows you to quickly top-up your smartphone to 50% just in 30 minutes. The key design highlight of PowerCore II Slim 10000 is its .6 inches slim form factor that allows you to easily pocket it or hold it in the hand with the phone. This portable charger charges iPhones at maximum 12 watt charging speed (approximately 50% in 45 minutes). PowerCore II Slim 10000 also supports 18-watt fast input charging that lets you fully recharge it with a Quickcharge wall charger in 4 hours. PowerCore+ 10050 is a 18-watt QuickCharge 3.0 Input/Output powerbank weighing 8.4 oz (240 gm). This is a rather older model powerbank (hence heavier) and is best suited for QC 3.0 phones only such as LG V30, V20. G5, G6, etc. 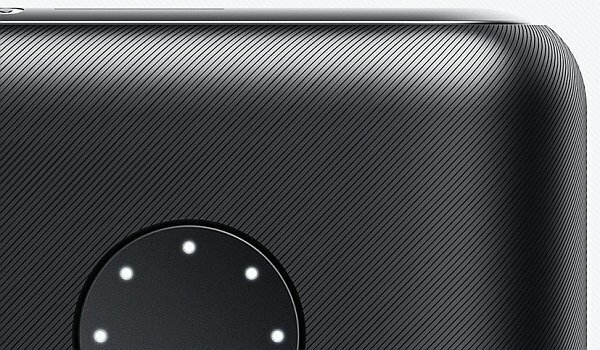 Samsung phones including newest S9/S9+ support up to QC 2.0 only and if you have a Samsung phone, than PowerCore II 10000 or PowerCore II Slim 10000 are better (and lower cost) choice. If you have a Quickcharge 3.0 phone, then this portable phone charger will charge the phone to about 70% in about 30 minutes. PowerCore+ 10050 can be charged using a QC 3.0 wall charger in 3.5 hours. 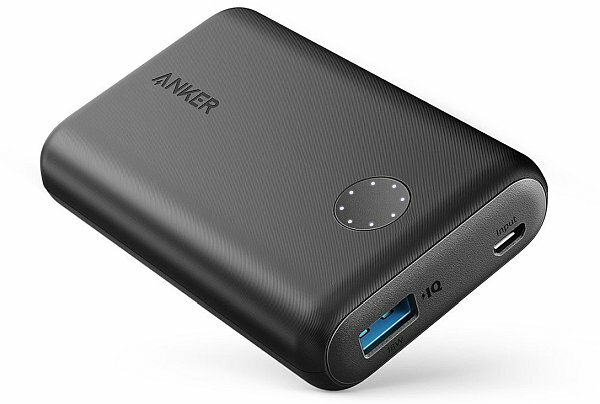 Anker PowerCore Speed 10000 QC is a 24-watt QuickCharge 3.0 Output only (No QC Input) powerbank weighing 7 oz (198 gm). This is suited for QC 3.0 phones and has slightly better charging performance for QC 3.0 phones than PowerCore+ 10050 (about 80% in 30 minutes) due to the higher 24 watt output. Again, this powerbank is not recommended if you have a Samsung smartphone as Samsungs have QC 2.0 only, and PowerCore II 10000 or PowerCore II Slim 10000 are lighter and lower priced powerbanks that will charge your Samsung phones to its maximum charging speed. Please note that Anker PowerCore Speed 10000 QC does not have Quickcharge input and takes 5.5 hours to charge using a 2 amp wall charger. If you want quick top up of 50% in 30 minutes and want a powerbank that can be recharged in 3.5 hrs, select either PowerCore II 10000 or PowerCore II Slim 10000 . If you want the lightest and most compact 10000 mah powerbank and are fine with 40-50% battery charging in 45 minutes, select PowerCore 10000. It will get recharged in 5.5 hrs. If you want to charge powerbank fully in 3.5 hrs, select either PowerCore II 10000 or PowerCore II Slim 10000. If you are fine with 5.5 hours to fully recharge the powerbank, the lower priced and lighter/smaller PowerCore 10000 is best. All the above three powerbanks will charge iPhones 7, 6S, 5s at fast charging speed with up to 50% charge in 45 minutes. 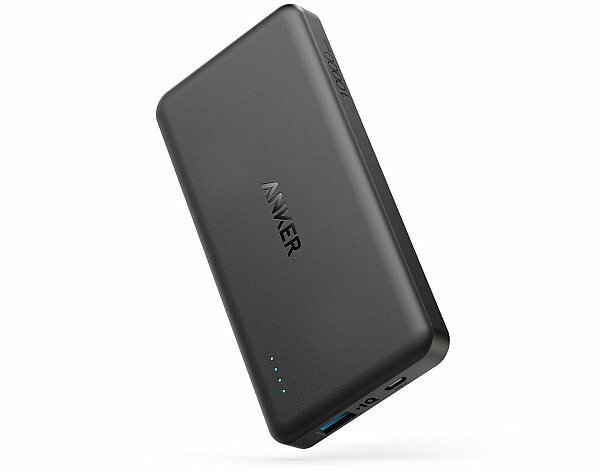 Either PowerCore+ 10050 (8.4 oz but gets charged in 3.5 hrs) or Anker PowerCore Speed 10000 QC (7oz light and slightly faster quikcharging performance but gets charged in 5.5 hrs) are great as both are priced the same. Of course, the much lower priced PowerCore 10000 is excellent as well, if quick top up is not that important. PowerCore 10000 will charge most Android phones to about 40-50% in 45 minutes which is an excellent charging speed. We tested PowerCore II with four phone models (iPhone 8, Samsung S8, and LG V20). Iphone 8 has a much smaller battery of 1821 mAh while the other phones have 3000 mAh battery. The noticeable thing with PowerCore II 10000 is the lack of any heating up that is the case with older fast charging powerbanks. PowerCore II 10000 charged iPhone 8 from 20% to 80% in just 45 minutes which is faster than expected with 100% charge in 1 hour 7 minutes. Samsung S8 was charged from 20% to 100% in slightly less than 40 minutes while LG V20 was charged from 20% to 100% in 44 minutes. PowerCore II 10000 fully charged iPhone 8 from 20% to 100% four times. It also fully charged the Samsung S8 and LG V20 which have much bigger batteries from 0% to 100% two times. Charging voltages are smooth throughout with hardly any noticeable heating, indicating high-quality batteries and charging circuits. There are many significant design changes in the new PowerCore II 10000 that make it much more user friendly and convenient than the previous generation PowerCore 10000. The new PowerCore II 10000 has a scratch resistant textured outer surface that is also easy to grip. The portable charger also has a very convenient eight-place LED battery status indicator, conveniently located on a clickable round button. This feature, previously found in PowerCore+ 10050 is much more convenient than a side-button and the eight-point indicator gives much better idea of battery capacity than the traditional 4 LEDs on most powerbanks. The powerbank has almost same dimensions (2.44 x 3.78 x 0.87 inches) as previous PowerCore 10000. PowerCore II 10000 weighs 7 ounces (210 gm) which is just slightly higher than the older version. Though it is quite compact, we are not a fan of its .87 inch thickness. 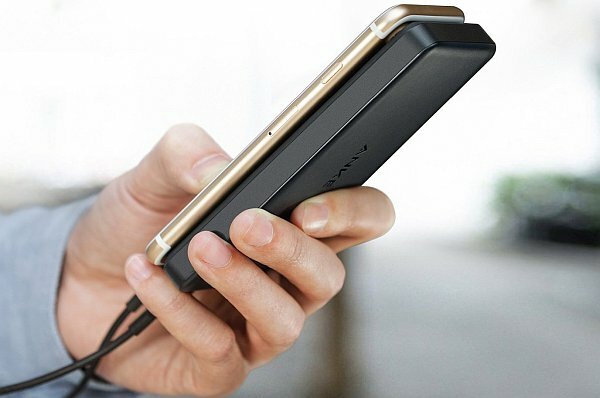 We feel that PowerCore II Slim 10000 with its pocketable .6 inch thickness and phone-sized dimensions is a much better design as you can hold PowerCore II Slim 10000 easily in the hand along with the phone while charging. PowerCore II 10000 has a quite sturdy build just like its predecessor PowerCore 10000 or Astro versions. The soft outer surface with a hardshell underneath makes it more drop-resistant han the previous portable chargers as the soft shell absorbs quite a bit of impact force. The USB connectors on PowerCore II 10000 are sturdy and high-quality. Our only gripe is that the portable charger only has one USB charging port. Another charging port would have made it almost a perfect powerbank! Overall, we feel that PowerCore II 10000 is an excellent compact powerbank with fastest 18-watt charge (50% in 30 mins) for the latest Samsung Android smartphones, other Android smartphones It is also perfect for all Apple iPhones, delivering fastest charging possible (12 watt) for iPhones 7, 7S, 6, 6S etc. It will also charge new iPhone 8, 8+ and iPhone X at 12-watt fast charging speed, the fastest speed possible by any 10000 mAH capacity powerbank in the market. We do however feel that PowerCore II Slim 10000 is a good competitor to PowerCore II 10000 as it offers the same fast charging features in a more slim and pocketable form factor and (a very minor) lower price. To summarize, if you want an ultra-light and compact (7 oz) fast charging powerbank that gets charged in just 4 hours and is capable of 2 full charges for Samsung S9, S8, S7, etc. and 3 full charges for iPhone 8, 7, 6, 6S etc. , go for PowerCore II 10000 . If you want a pocketable slim fast charging powerbank (7.35 oz) that is easy to hold in hand with the phone, gets charged in 4 hours, can give 2 full charges for Samsung S9, S8, S7, etc. and 3 full charges for iPhone 8, 7, 6, 6S etc. , go for PowerCore II Slim 10000. PowerBankGuide.com is a participant in the Amazon Services LLC Associates Program - an affiliate advertising program that enables websites to earn fees by advertising and linking to products on amazon.com. The Amazon logo and Amazon are trademarks of Amazon.com Inc. or its affiliates.